Do you have enough? What does having enough mean? Having enough means you can participate in society with dignity. Those that don’t have enough have to rely on the charity of others. And that can take away their dignity. Think about those who don’t have enough – they’re panhandling for food, visiting a food bank to pick up a few canned goods, sleeping at the shelter or on the street, and looking for donated clothing and shoes. Their Employment and Income Assistance (EIA) cheques aren’t enough to have enough to eat, find adequate and safe housing or buy warm clothes. And it’s even worse for those that have to provide for their children or those with a disability that prevents them from participating in the workforce. Most are deeply ashamed. Now let’s think about providing everyone with a basic guaranteed income. Instead of panhandling, they’re going to the grocery store and buying the food their family needs. They’re clothing their family and finding safe and affordable housing. They’re going to school. All without having to rely on the charity of others. They’re participating in society and contributing to the economy. With dignity. We need to take care of our citizens, so everyone can realize their hopes and dreams. Canada is a caring country and we’ll all be richer for it. 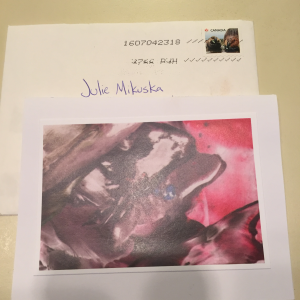 I received a lovely gift in the mail today – a handwritten thank you on a card featuring the artwork of a client, hand-addressed with a real stamp on the envelope. A real stand-out in my mailbox! 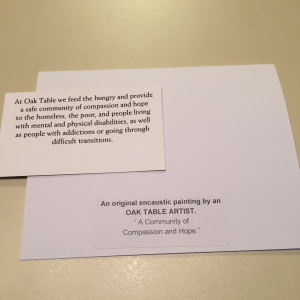 The card was from 1JustCity, an umbrella organization in Winnipeg bringing together four community ministries: Oak Table, North End Stella Community Ministry, West Broadway Community Services and St. Matthews Maryland Community Ministry. 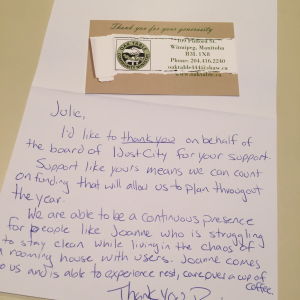 They do amazing work and, in their own words, they “love the under-loved.” And we get to work with them as clients. And in one short card, they told me what a difference I’m making in the life of one person. And because I’m a monthly donor, I’ll think of Joanne and others like her every month as I’m notified of my donation through CanadaHelps. How are you thanking your donors? They are not interchangeable. You can’t pick up a new lot at the hardware store. And they need maintenance. Now, I’m sure most people in social impact organizations recognize that donors aren’t widgets, but why then is there a tendency to concentrate on getting new donors and not on keeping the ones you have? The longer donors stay with you, the longer they stay with you. And that means you don’t have to go out looking for so many new donors, many of whom won’t stay with you. Your loyal donors are the ones who get how important monthly giving is. And they may increase their annual gifts over time. Plus they are great candidates to approach about putting you in their wills. So concentrate on loving the people who already love you – the donors! Make strategies to get to know them and to let them know how important they are to you. Remember: they’re people, not widgets. I was excited to receive an envelope of material from a social impact organization that I supported last year. As it looked like there was a lot of stuff in the package, I looked forward to pulling it apart and reading it. And why is that a bad thing? There was no focus to the package and it was not donor-centred. It was a big collection of everything the organization wanted to tell me about the good work they are doing in the community. But it didn’t involve me, celebrate me or tell me the ways I’m doing good in the world by having an impact on individuals. I don’t need to see corporate logos in my newsletter. That’s recognition for them, not me. I need stories about the difference I am making in the world. Separate your messages i.e. don’t send a letter asking for gifts with an invitation to the AGM – send it separately with a pledge card. Send a donor-focused, story-filled newsletter to donors telling them they’re your heroes, not a bragging newsletter about how great you are. Don’t just dump a whole pile of messages into one package to save on postage. You’ll get better results by tailoring your messages. Because then I’ll be inclined to read what you send, instead of sending the lot to the recycling bin. Hands up all you fundraisers that rarely, if ever, get to attend a professional development session on fundraising. In this virtual room, my guess is that a lot of you metaphorically raised your hand. What other sector would place so little emphasis on professional development and continuous learning? A lot of social impact organizations see PD as an expense, and it’s usually the first thing to be chopped in the annual budget cutting exercise. That’s a short-sighted move that is detrimental to the entire organization. 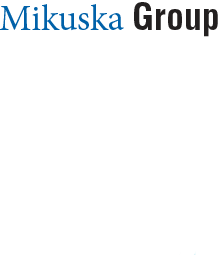 Investing in staff’s professional development is an investment in the organization. Learning new and innovative techniques, hearing about ideas that have worked in other organizations, and networking with other fundraisers can be a huge motivator. And chances are greater that you’ll remain in your position far longer if you aren’t looking around for an organization that’s willing to invest in you. That’s astonishing! Now point that out to your ED/CEO and get your training back in the budget.